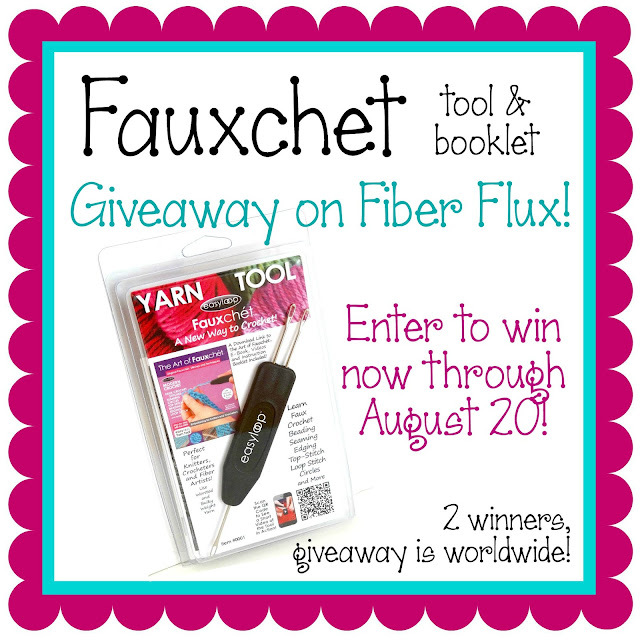 Fiber Flux: Introducing Fauxchet + Giveaway!! Have you tried to "fauxchet" yet? I just love trying new and interesting things and when the good folks at Leisure Arts sent me an Easyloop yarn tool, I was definitely intrigued. 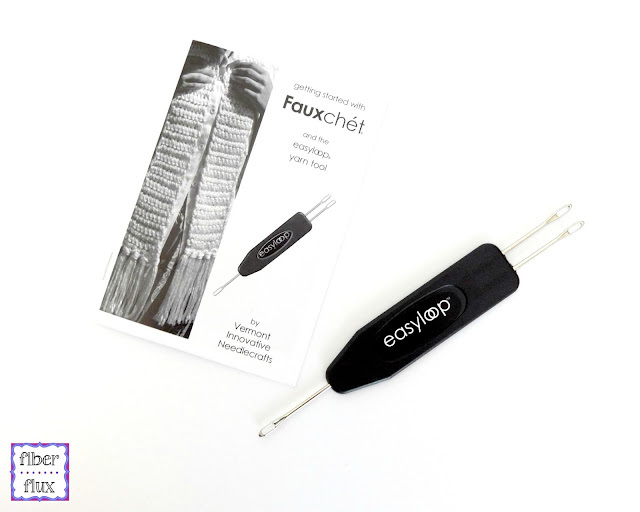 This tool is a different way to crochet...if you love gadgets and trying new ways to work with yarn, this is definitely something you might like! Check out my new review and tutorial demonstrating Fauxchet and the Easyloop tool! The set comes with the tool and a booklet, complete with photo instructions on how to use the tool, a few basic stitches, plus a pretty scarf pattern too! Can't wait? Need more? Click below to purchase...makes a unique gift too! Enter to win using the Rafflecopter below. I have two sets and will choose one winner per set...that's TWO winners! Giveaway ends August 20 and is open worldwide...now go, go, go and enter!! I have never heard of this but it seems like it could be fun. It's always fun learning something new! Thanks for the info on this new tool. Would love to try it. I've never seen this tool before so therefore never used it, lol, if I won it I would probably figure away to make a scarf since that's what I enjoy making. Thank you for the opportunity to win this. I'm always curious about new techniques. I would like to try this new tool!!! I have not used this tool but sure would love to!! I think this gadget is pretty nifty! I'd love it try it out :) I love scarves so I'd make a scarf for the winter with it! Love to win it! It's complete new to me, but I'd like to try! Would love to try this tool! It looks fun! I'd start with something simple, like a scarf. I'm really intrigued. Thanks for the chance! I like to try new techniques and this one looks interesting. I have not used this yet, but have seen it and wondered how it worked.. Thanks for the giveaway!! Interesting tool! Sorry very y like to try it!!! I've never used anything like this before. Not sure what I'd make first...maybe a scarf? Always excited to try new things. This looks like so much fun. Interesting. I have a hard time crocheting with a hook, this would solve my problem. Thanks for the video. I hadn't heard of this new tool until I read about it here on your blog. Making a scarf would be a great way to try it out! Looks fun, I would use it for scarves! I have never heard of it, but I love trying new things and new gadgets!!! Awesome giveaway! Fingers crossed. Always interested in new ways to use yarn! Thanks for sharing. I have never used this tool but I have look at it several times. Its interesting. Idk what I would make but I would def put it to good use! Thanks! I wonder if it's harder or easier using this with my arthritis? I would certainly love to try it! I have never used this tool before and would love to try it ! Ty for the review! I hope I win! This took is awesome! I haven't tried fauchet, but being new to crochet I would love to try my hand at making a rug using this method. I have used and I love your blog please keep it up, I have never won any thing. I've never used one so it would be a good time to learn! I would like to try making a rug and maybe a pillow.later after I got use to doing it I would like to make up a pattern to look like my Multipoo dogs. never used it! I'm not sure what I'd make yet, I'd have to do some research! I have never seen or tried anything like this before. It really looks like it would be easy to do. I would most likely make something easy like a scarf or something to try it out first. I guess I would start with an easy project ...maybe a cap made of a rectangle and matching wristwarmers. I HAVE NEVER HEARD OF IT BEFORE BUT I ENJOY ALL KINDS OF CRAFT,I WOULD LIKE TO MAKE A RUG USING THIS FAUCHET. I would love to try making a rug with the Fauxchet...it looks interesting! Never heard of it before but it looks like its be a fun new thing to try! Looks very interesting. I'm always open to trying something new. Never used this before. Probably would make a scarf first. I haven't used it before but I would love to. I love crafting and have always wanted to master crochet and make a scarf! No, but it would be interesting to try it out!